देश में बंपर पैदावार फिर विदेश से अनाज क्यों मंगाए? 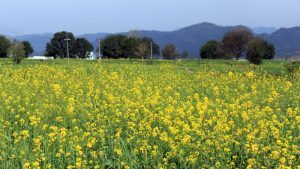 On 11 May 2017, India’s regulator for transgenic products, the Genetic Engineering Appraisal Committee (GEAC) under the Environment Ministry recommended approval for commercial production of GM mustard. If the Ministry grants permission, it will be a first for a GM food crop in India. GM crops have been a contentious issue in India for over two decades. After BT cotton was approved in 2002, India has not been able to approve any other genetically modified crop for cultivation. BT brinjal was cleared by the GEAC in 2010 but was put on hold by then Environment Minister Jairam Ramesh following protests from civil society groups. Activists convinced the government to put an indefinite moratorium on BT brinjal and now they want to do the same with mustard. They have been threatening nationwide protest in case government grants approval. Anti GM crop activists argue that the introduction of genetically modified foods could reduce biodiversity, so important for plant survival. In their opinion, corporations developing genetically modified seeds do not work in the interest of farmers. GM seeds tend to be more expensive than conventional varieties and farmers have to buy them every year– they can’t be replanted. But those in favour say that the higher yield of genetically modified crops makes up for the higher cost of acquiring the seeds. They also point to an oft-cited, but misleading study used by anti-GM activists. It is important to point out here that GM mustard has been developed, not by a multinational corporation, but by the Delhi University-based Centre for Genetic Manipulation of Crop Plants (CGMCP). It appears that there is a lot misgivings being deliberately created about GM mustard. Agriculture experts say that genetically engineered mustard is as nutritious as the conventionally grown varieties in India. In addition, no ill effect on human health has been shown as a result of the consumption of GM food in the countries where they have been approved. Experts contend that there is no evidence to suggest that the transgenes could be transferred to humans or animals through consumption of GE food. Concerns on the possibility of genetically engineered plant getting introduced wild and necessitating increased use of chemicals in agriculture, too seem misplaced. The strongest argument in favour of GM mustard appears to be that the new variety promises higher yields. India is heavily dependent on import of edible oils (over 60% of India’s domestic requirement is imported) and a large portion comes from Argentina and Brazil which allows GM technology (in soybean and canola). Experience shows BT cotton has benefited cotton farmers in a big way. They no longer have to contend with bollworm which used to plague the crop earlier. Besides, clearance of GM mustard could also be instrumental in sending a positive message to the industry and encourage companies to invest in agricultural research. When the Vajpayee government approved BT cotton in 2002, it paved the way for a lot of scientific researchin agriculture.Approving GM mustard could open up possibilities for research and adoption of new agricultural technologies beneficial for farmers. Last, but not the least, at a time when food prices are low, the only way a farmer can still make a profit on his investment is through increasing yield. High-yielding varieties of mustard like GM mustard could do that for him. Fears that a go-ahead for GM mustard will clear the door for powerful multinational companies and increase the use of toxic herbicide are totally misplaced. The technology is indigenous and funded by the government of India. In a developing country like India, where agriculture, the backbone of the economy is heavily dependent on the vagaries of the weather, the introduction of a technology that promises better yields, reduced farm costs and higher farmers’ profits, makes sense. It could be a baby step toward India’s food security. Mission : To bring 'Agriculture News, Research & Analysis' - to keep people informed about the sector, where 55% of Indians are employed.